The diagrams below show two methods of collecting water for irrigation purposes. The diagrams give information about two conventional techniques to take the water to be flowed into the farmlands. The first method called 'swing basket'. It needs some equipments that are two long strong ropes and a basket made of bamboo or leather. To get the water, the basket must be tied in the centre of ropes, then the ropes are held by two persons in each point. This way can be used to reach the water in 1 - 2 metres depth. The second technique is named 'rope and bucket'. It needs pulley, rollers and bucket as the equipments. It also use the strength of an ox to take up the water. The ox is placed in the slope that the body is banded with the pulley. Because of the power of the ox and the gravitation of the sloping plains, the water can be gained even in 50 metres depth. By these methods, there are three main differences that are the equipments needed, the depth can be reached and the power sources to get the water. A good paragraph consists of at least three sentences. I suggest rewriting this paragraph above. A brief comparison of how water is collected for the aim of irrigation. As seen, different methods are used in this diagram. 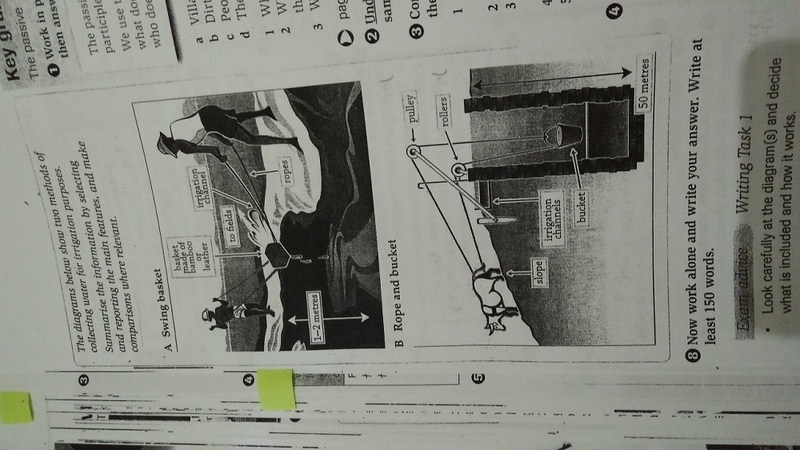 While the first diagram shows how two menial workers are involved in this process namely swing basket, the latter one using rope and bucket presents more complicated way to take water. Home / Writing Feedback / The two conventional techniques to take the water to be flowed into the farmlands.